This is a fresh new messaging app built and designed exclusively for iOS. Simply create a quick profile to get started. Send Unlimited Messages, Photos, Videos, and Audio to friends for free! Customize the background using unique color gradients. Q: Why is the app priced at $299 USD? A: To start the app costed well over $3,500 to develop, the average cost to develop a social network such as this one is between $250K to $500K. This app took over a year to distribute from concept to finalized product. The price is set at $299 because I do not want the App Store flooded with recreations of this app. TapApp is an elite app, and probably one of the most unique product available on Chupamobile. Q: Is it easy to change the graphics, server information and submit to the App Store? A: TapApp's source code is incredibly well organized which allows for easy change to the app. It is well commented and parsed also. Graphics are all located in a centralized location within the application, easily accessible from a single folder. This allows for easy and quick change of images. Regarding server information, this can be changed in a matter of minutes, and the guide provides clear instruction on how to do so. Q: If I have a private question, will I be able to contact you? A: For every client or company that decides to purchase this application, I include my email address so you can contact me directly for help and support. I respond to all questions and concerns within 2 business days of receiving the comment. The app is incredibly easily to edit and reskin. All of the graphics are located in one centralized folder for easy access. The code is well written and well parsed to easily edit and change. A detailed video guide is provided in the documentation for easy customization. TapApp is a secure app that transmits messages and content over a secured SSL Connection. This includes images, videos, location, and sound files. The application uses some of todays most advanced Frameworks and SDK's to run. An elastic Amazon web server handles the storage of videos and other attachment files. The app uses cloud coded push notifications instead of the average, slow, php notification script. This feature allows notifications to be sent around the world in a fraction of a second. User account information and messages are encrypted and stored securely on a cloud server managed by PARSE. Parse is an application framework that allows applications to host content on a secure cloud platform. For more information on parse you can visit their website. It only takes a few minutes of setup, to change all of the apps server information to yours. TapApp has a one of a kind design that no other app in the world has. TapApp has a fresh and intuitive interface, designed to add a new layer to social networking. It took us over 5 months to develop and integrate the interface on this application alone! The app also features intuitive gesture based movements for seamless navigation. For example, to access the menu panel, simply swipe right across the screen from any page. On the apps version in the App Store, allow tint colors are free. In the code however, you can make certain tint colors paid and others free with a change of three words! It is that simple, the code has been optimized so you can start generating income as soon as you launch this product. 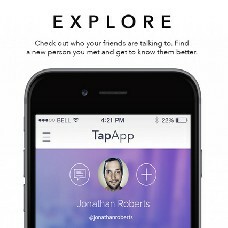 TapApp has a unique feature unlike any other application available, you can see who your friends talk to most by visiting their profile. On their profile you can view their username, about me section, and see profile pictures of the contacts that your friends communicate with most. The profile pictures located at the bottom of screen can easily be moved around to a different portion of the screen if you decide to do so. More information on redesigning the profile page is available in the detailed guide. The best feature about the app is the ability to communicate for free with anyone you want. You can send attachments to friends such as full length videos or images. You can also send a blast message to all of your contacts or selected ones. When we developed TapApp, one of our biggest concerns was user privacy. We wanted users to enjoy the app and not have to be concerned about safety. If someone on the application is threatening you, or being abusive, you can simply block them and they can not communicate with you any further. Before users can communicate, they have to send a contact request to ensure the people in your contacts are the right ones.